My first experience that felt like a submarine was not in a submarine at all. There were guys who could not make it through this experience and never got to subs. 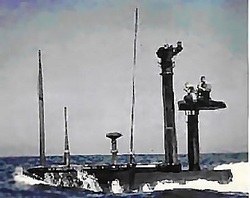 The tower on the left is the submarine escape tank. I think this is the one in New London but I am not sure. There was another at Pearl Harbor. The tower on the right is an elevator. The tank had heights of 50 and 100 feet. We had to prove we could escape from the depth of 50' if I remember correctly. First we were put through a simple pressure chamber. We were loaded into it in bathing suits. It was pressurized and things got very warm. We proved we could handle the pressure without rupturing something important (at the time it was all important). Then they let off the pressure. If our nose or ears started bleeding we were shipped off to sick bay. If not, this tower was next. We took the elevator up to 50 feet from the top. We loaded into a pressure tank with doors on both ends. They shut the doors, let some water flood in and equalized the pressure to the water pressure in the tank. Open the door and blow and go. Divers would punch us in the stomach all the way to the top if we forgot to go ho ho ho inside the little hood we had to wear. That kept us from having embolisms. In 1968 a strange thing happened. The tower was put out of commission by a fire. We took a trip that wound up in England and the Scorpion was lost the day we got into port. Since escaping from a wounded sub was suddenly of paramount importance I got a chance to see how the British did it. They had a full suit instead of a little hood like ours. They also, therefore, had a better chance of survival. All that because the boats all had an escape chamber. The door is on the side and you could swim out. It gave the ships corpsman a pressure chamber if there was a diving accident. It also allowed you to offload swimmers in certain operations which may or may not have ever happened. The escape tank got you ready for this and screened out folks who couldn't stand the pressure of close spaces. More about that later. I don’t think how a submarine works is a big mystery anymore. There do seem to be some unanswered questions that I get asked in conversation all the time. It normally happens pretty fast when folks hear that I was a submariner. This was my first boat, the USS Clamagore (SS343). 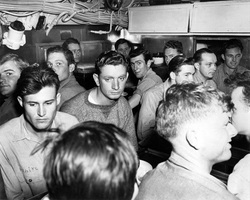 According to Google this is the actual mess hall on the same boat. It is located in the forward part of the After Battery Space. If I remember correctly it would seat 16 people trying to wolf down some of the best chow in the military. Yup, I was fat before I married the world's best cook. Good food and crowded conditions do that to you. I remember this mess as being stainless steel but the Clamagore is now a museum boat and pretty soon I understand it’s going to become an artificial reef. Things change. 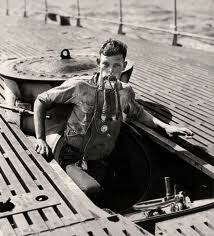 Ever think about how one takes out the trash on a submarine. There is an art to it. This thing that looks like a torpedo tube is actually a submarine Garbage Disposal Unit. It is also located in the forward part of the after battery space. There is a bag that looks like a sock that one loads with trash. It has a weight in the bottom. Once the unit is loaded, the pressures are equalized, the outer doors are open and the stuff falls out. If I remember correctly water is pumped through to flush the tube clean. Water because an air blast is too noisy and you never make unnecessary noise if you can help it. The weighted garbage falls to the bottom and over time the bag will deteriorate. Fish consume the whole mess except the metal weight one supposes. Cardboard and plastic do not routinely make that trip. Cardboard can be weighted and thrown over the side when we are on the surface but I mostly remember it being saved in the spaces outboard the bunks till we hit port. This picture was taken on the Tambor during WW2, and I included it for perspective. The picture above did not give a good feeling for how small it got when you filled it with sailors. The following picture will help you locate the After Battery space. Look to the right of the four main engines (red lego blocks) for the after battery space. For me the most important thing about the after battery was right behind that bulkhead. This was my sick bay. It was on the forward bulkhead (wall) of the compartment facing aft. This is called Hogans Alley for reasons that now slip my mind. If this is actually the Clamagore as google claims, the whole berthing compartment was altered. The bunk in the corner was mine. It disturbed less people when I was awakened by someone needing help. I had a metal bunk locker just like the bed in the lower right corner of the picture. The bunks with the pipe railings had springs and in real life before it was a museum boat there were four bunks on the inner bulkhead. However I crawled into bed was how I slept. No room to sleep on the side or turn over. When we loaded for a long patrol the deck you see here was loaded with boxes of food. Always cans so we could walk on them. There were also cases of food loaded into each bunk. Move them when you turned in. This is what it can look like when it gets all cleaned up. You do not actually see the mattress. There is a plastic cover (green above and blue here) that supposedly was for retarding flame but I think it was to hide the fact that we were on a pig boat. 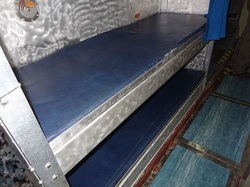 The chains on the bunks are so that they may be pulled up against the bulkhead. Torpedo Room Bunks Some bunks and berthing areas were more spartan than others. I think these are conventional torpedoes. They slept on the Nuclear ones the same way. A toilet like this sank a German submarine, or so I read on google somewhere. I can see how that could happen. Sewage was kept in a tank with a valve separating it from the outside sea pressure. Using this toilet was fairly simple. Blowing the sanitary tank was not. Not knowing what you were doing could be very smelly and dangerous. Something bad happened to a young fellow I met on the sailfish. He enlisted for subs but was claustrophobic. We picked him up in Pearl and went to Japan. He had not been screened out by the escape tank. He had to be offloaded in Japan and blew some contents of one of these all over his uniform as his last official act. Bon Voyage. There is a little passageway that separates these two sinks and shower from the toilet. The shower was where you stored the potatoes. Underway we pulled the potatoes and opened the showers every ten days. You had to save water so there was a valve that allowed you to turn it off after you set your hot and cold mixture. The routine was to set the mixture of hot/cold, get wet, turn it off, soap down, and rinse it off. I still cannot make myself take a long shower unless I have a batch of aches and pains. The Nucs have 10 times the capacity to make water and unlimited power to do it. That’s why air baths became so important. This is not a google picture and two of the names have been lost to me but I remember them all. The officer on the left is Captain D.M. Ulmer who was the skipper. The XO was Commander J.R. Spear. Their jobs were to see that all this ran smoothly. Great officers. I reported directly to the XO most of the time. Captain Ulmer had a very busy day seeing that his ship didn’t run aground or create an international incident. He was realistically too busy to bother on routine matters. When someone was sick one of these men would talk to me. Otherwise I was pretty much of the opinion that I should stay out of their way and do my job. When I went to see them it was always important. That is an attitude I carried forth into civilian life. Sometimes that was good, sometimes bad. Some of those important times I had to see them actually quickly became routine. This boat has the snorkel masts raised. Normally nobody sets on the exhaust. Either he is working on it or this is a gag. The flat spot the man is setting on is normally about six inches below the surface pushing out exhaust. The mast to the left of it is the air intake. This appears to be a Nuclear Boat sail so who knows whats going on. They seldom snorkel. If it was snorkeling and it was a diesel it would be because the engineer or the corpsman said it was needed or it was a planned event. The engineer (electricians) because the batteries needed charging or the corpsmen because the air needed changing. This was routine stuff. When the CO2 levels went up it was time to get fresh air. I can no longer find the pictures of the ancient CO2 analyzer I used. Didn’t matter much. The smokers would tell me it was time. Their cigarettes wouldn’t stay lit. Choices then were to snorkel or scrub the CO2 and bleed some air from the compressed air banks. I know it sounds like I'm saying I was a "big deal" here but not really. Like everything else in subs, it was a team effort. 5 minutes of snorkeling made things much better and took the place of a lot of work. Sometimes we just couldn’t snorkel because we dare not be seen. If it had to do with health the corpsman was involved. Best job I ever had but the potential was there to be busy. 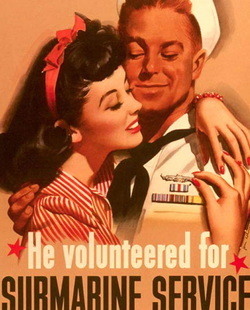 I spent as much time underway pretending to be a Sonarman as I did doing my job as a corpsman. The consul on the left with the little steering wheel appears to be my sonar. I spent many hours listening to the fish and whatever was passing by. By the time I left the Clamagore I was a watch supervisor and really wasn't able to do that on my next boat. Sally and I had not actually met yet but if we had we would have looked like this. That insignia she is touching is for completed war patrols. 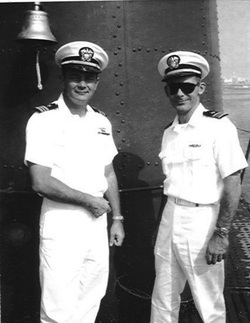 I knew several submariners who wore them that were still kicking around in 1966-1970 while I was riding the boats. I guess they would all be pushing 90 if alive today. More things may show up here when I think of them. If you enjoyed the read, check back. Sometimes we really are products of our past. After submarines there hasn't been very much that I considered life or death. Some of that was pretty exciting stuff.